How do the newer implants for total ankle arthroplasty stack up against older implants in terms of improvements in patients’ functional outcomes? 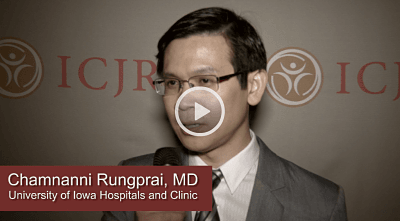 Chamnanni Rungprai, MD, and his colleagues at the University of Iowa in Iowa City sought to answer that question with their study, “Outcomes and Complications of Four Total Ankle Replacement: A Comparative Study” (Poster 215), presented at the 2016 Annual Meeting of the American Academy of Orthopaedic Surgeons in Orlando. Ankle image from: Pagenstert G, Hintermann B. Simultaneous bilateral total knee and ankle arthroplasty as a single surgical procedure. BMC Musculoskeletal Disorders 2011, 12:233 doi:10.1186/1471-2474-12-233. Accessed 3/20/16. © 2011 Pagenstert and Hintermann; licensee BioMed Central Ltd. This is an Open Access article distributed under the terms of the Creative Commons Attribution License (http://creativecommons.org/licenses/by/2.0), which permits unrestricted use, distribution, and reproduction in any medium, provided the original work is properly cited. Previous articleICJR Interviews: Does Rotational Malalignment Cause TKA Pain?